The article studies the tremendously influential effect of one individual upon the origins of the Christian religion. It is an exploration of the origins of Paul’s thinking and his role in the development of the early church. It considers Paul’s unique background and why that provided him special access to audiences and means to spread his message. It traces Paul’s interactions with the Nazorean sect and the philosophical and political sources that served to produce a new religion premised upon Judaic and mystical concepts made palatable to a Gentile audience by Paul’s special innovations. 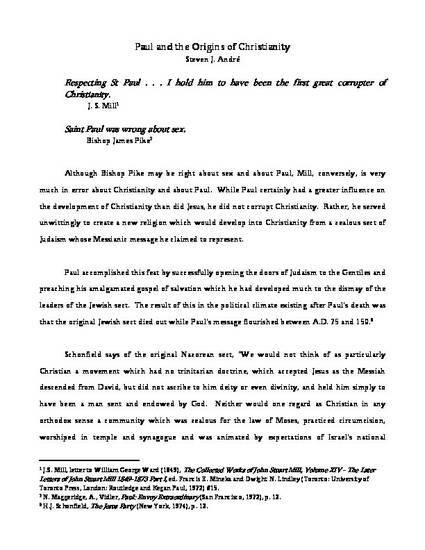 In addition, it discusses the scholarly debate over the influence of oriental thought upon the development of Paul’s gospel and the spread of that doctrine.